Over 200 people gathered last night at Preservation Park in downtown Oakland, California, for a spirited town hall with the Federal Communications Commission’s new chairman, Tom Wheeler. 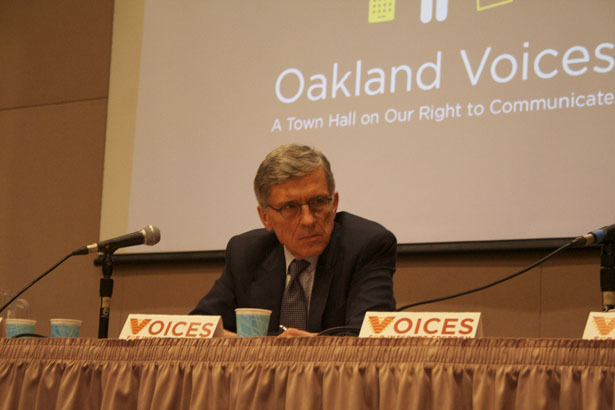 The event, titled “Oakland Voices: A Town Hall on Our Right to Communicate,” offered attendees a rare chance to shape the direction of the country’s new FCC administration. Wheeler, who assumed leadership of the FCC in November, seemed receptive, taking vigorous notes and pausing occasionally to listen intently to the speakers. The event, which was hosted by Voices for Internet Freedom, a network that advocates for Internet access and freedom in communities of color, allotted speaking time for about thirty audience members. Community members, advocates and leaders spoke directly to the Chairman, raising concerns about everything from Lifeline eligibility for people without Social Security numbers to the low broadband Internet capacity of local libraries. One speaker, Karen Gonzalez, described the exorbitant rates she pays to stay in touch with her son who was sentenced to twenty years in prison as a 17-year-old in 2010. She choked back tears as she explained that her son is now serving his sentence in a state prison fourteen hours away from their home. Though he is still in California, the family must pay costly phone bills to stay in touch with him. Teresa Favuzzi, executive director of the California Foundation for Independent Living Centers, stressed the importance of programs designed to make the Internet more accessible to the disabled community. Favuzzi decried the high unemployment rate for people with disabilities, which stands at 12.3 percent—nearly twice as high as the rate for able-bodied people, according to the Bureau of Labor Statistics’s November 2013 report. She highlighted that people with disabilities need affordable access to high-speed Internet and wireless applications that increase accessibility in order to live independently. The chairman listened to a range of other concerns from the audience, including media representation of the poor and media ownership. At one point, a speaker criticized the chairman for his work in the wireless industry and the expansion of wireless networks, saying they cause brain tumors. The group protested the event outside of the building and passed out stickers with the QR code for their website. Beyond addressing the country’s complex communications challenges, the town hall meeting also offered an early glimpse into the values and character that will shape Wheeler’s administration. At the beginning of his remarks, Wheeler was proud to point out that, now in his third month as chairman, he has yet to make an appearance in Washington, DC. He said he wanted to send a message to the country that his administration is rooted in the lived realities of people outside Capitol Hill. The chairman directly commented on a few key policy issues, including the country’s telephone transition from copper-based networks to Internet Protocol, which is commonly referred to as the “IP transition.” He criticized companies that argue that the country should shed old telephone regulations as companies adopt new Internet-based technologies. Instead, he hopes Internet service companies follow a “network compact” as the country moves to an IP-based telephone system. The network compact, coined by the chairman in a blog post last year, describes four values of communications law—public safety, universal access, competition and consumer protection. The “network compact,” though, has no legal, enforceable value. Wheeler was particularly touched by Gonzalez’s story of the financial hardships of staying in touch with her son in prison. He praised former FCC Commissioner Mignon Clyburn’s order, issued in August, which capped interstate prison phone calls to twenty-five cents per minute and banned extra fees for using a debit or calling card. Just a month after the order was issued, Securus and other prison phone industry companies announced they would file a lawsuit against the Commission over the “below-cost” new rates. Wheeler also plugged one of his first acts as chairman—ending proposed rule changes that would have relaxed cross-ownership restrictions so companies could merge more easily. He also said his administration would “do things differently” when it comes to “shell companies,” that is, broadcast companies that evade the FCC’s ownership rules through local marketing agreements. Through those agreements, a local broadcast station might only own the broadcast license, but a larger company owns everything else from the reporters to camera equipment. At the end of the event, Wheeler was presented with a “gift” of signed petitions from people across the country requesting future public town hall–style events with the entire commission. Though the commission is not scheduled to attend another town hall meeting in the near future, the chairman’s warm reception last night bodes well for that possibility. Read more from Leticia Miranda about the regulation fight around Internet-based telephone service here.